It’s been hard to write about this moment till now because quite frankly I’ve been on Cloud Nine and I wasn’t sure if I was going to be able to verbalize just how I felt about receiving this recognition. It’s the culmination of a lot of different things and ultimately I needed to write this blog so I could thank everyone involved. 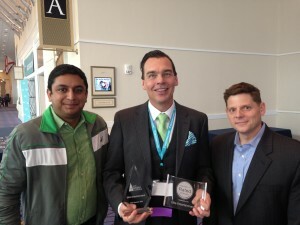 We received 245 reviews last year on WeddingWire which is what earned us the award. 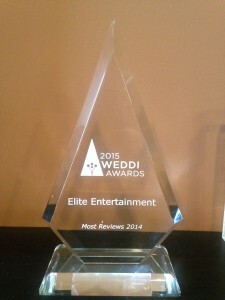 WeddingWire recognized the leader in every category (venue, photographer, DJ etc) throughout the country but of those, Elite received the most reviews! By the way the 245 reviews represents almost 40% of the couples we had the pleasure of working for in 2014. That’s a lot of weddings and lot of writing! First and foremost I have to start where I so often do, and give THANKS to my incredible staff of DJs. Every weekend we load up our vehicles and hit the roads to entertain at some pretty awesome events. We leave our families for the day and spend that time doing what we LOVE – spinning music and creating memories. It’s hard work but we also have a passion for it. And when it’s all said and done and the party is over and we’ve loaded our gear back into our vehicles and headed home, I’ve asked my staff to be diligent about one more thing: following up with their clients and asking for a review on WeddingWire. Some will call and make the request, some will send an email. But it takes the effort of asking to produce the numbers we have. And for all of that (the great DJing, the leaving the family on the weekends and the follow up) I send my sincere gratitude. Secondly, I want to THANK our great brides and grooms. I know from firsthand experience that everyone wants a review these days. I flew to Las Vegas recently and when I got checked in at the hotel I looked at my emails. I already had 3 requests to “Rate My Experience.” United Airlines wanted to know how the flight went, Expedia wanted to know what I thought of the hotel and the hotel wanted me to rate my “Check-In Experience.” (whatever that meant.) I ignored all 3 requests because none of my experiences were so outstanding that I wanted to take the time to review them. And I think that’s where we are as a society. Review requests come in all the time. Most people, like myself, will take the time to offer a review if we’re blown away by the experience (either amazingly impressed or incredibly disappointed.) And I fully expect that from our brides and grooms. If we haven’t exceeded every expectation you had before the wedding, don’t bother clicking on WeddingWire. But if we lived up to your highest hopes and helped you throw the party you always imagined, then please try to find a few minutes in your busy day to tell the world about it. In 2014, that happened a lot. 245 times to be exact. And finally, I should also tip my cap and say thanks to WeddingWire. They created this incredible portal where brides and grooms can talk about their real-life experiences with their wedding vendors. Some professionals are afraid of review sites because they can expose your “soft white underbelly.” I often hear the push back posited as “what if my competition wants to get on there and pose as a past client and bash me.” WeddingWire actually has a fix for that. If someone posts something negative you can ask them to prove they had a contract with you (and if they can’t the review comes down.) But when I hear someone say this I immediately think to myself “what’s your real fear?” Maybe it’s that you don’t exceed your clients expectations and you’re afraid of a platform like WeddingWire (or The Knot or Yelp!) where it’s all about the truth. I don’t have that fear. I’m confident my DJs live up to or transcend our reputation every weekend and so I’m grateful for a place like WeddingWire where past clients can tell future clients about their experience. WeddingWire has created that and now, with these Weddi Awards they’ve also created a way to recognize the vendors who put in the most effort. When Sonny Ganguly (Chief Marketing Officer for Wedding Wire) brought me to the stage to accept the award he gave me a nice introduction (made me sound like a super star, in fact, which was too nice!) But I wish he had focused more on Elite Entertainment. I personally did 40 weddings in 2014 so clearly those 254 reviews didn’t come just from my clients (although I did have the highest percentage of reviews – for the 3rd straight year!). Those 245 reviews came from every one of my DJs and of course the couples who took the time to write us a review. It was a total group effort and one that I am incredibly proud of.